The kitchen is like the heart beat of the home. It’s where people gather to eat, share their day and spend time just being together. It is a gathering place. A room where memories are made, announcements shared and milestones celebrated. It’s the room in the house that is used the most. A decision to spend your time and resources in a kitchen remodeling project is a large one. That’s for sure. When you start to think about it, there are so many pieces to the process it may be difficult to know where to start. Fortunately, for the both of us, you found, ContractorMen. We specialize in General Construction projects. We wish we could say we specialize in Kitchen remodeling but the fact is that we specialize in a lot of design and build projects because we’ve been in the business for a very long time and have done a lot of kitchen remodeling. We make it easier for you to remodel your kitchen because we handle every piece of the remodeling project; from plumbing to tile, from electrical to kitchen cabinets, we execute each phase of your kitchen remodeling project expertly. We always communicate with our clients and involve them in the decision making process. The largest decision in a kitchen remodel is how to remodel the cabinets. Taking your remodeling budget into consideration, we always ask homeowners what elements of the kitchen they may want to splurge on or make a statement with. The answer may be the kitchen cabinets. An excellent option for homeowners who are looking to update their kitchens without moving walls or replacing all the kitchen cabinets is to replace only the doors of the kitchen cabinets. Your current kitchen cabinet doors may be dated by a cut out groove in the wood or they may not be sturdy enough for your taste. Replacing the doors with an updated look, and new hardware completes the kitchen cabinet update. Don’t forget to add soft closing hinges and drawers for that designer touch! If you desire a look that is all your own, if kitchen cabinets from Lowe’s or IKEA are not your style and if the kitchen cabinets you have no longer serve a purpose to you, custom kitchen cabinets can be crafted to your exact specifications and design. 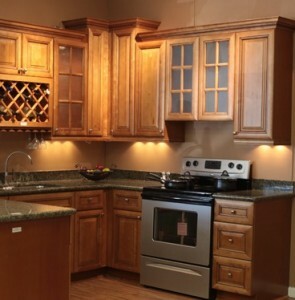 Custom cabinets can be made from Birch, Maple, Oak, Mahogany, Cherry or Knotty Elder woods. Clients who choose custom kitchen cabinets know that having something unique and special is what will set their kitchen apart and hey will ow have the kitchen exactly the way they need it to be. As a General Contractor your kitchen cabinets will be expertly measured, designed, created and installed. If your cabinet surfaces have not been saturated with grease a good option for remodeling your kitchen cabinets is to keep the existing cabinets and repaint them. If the cabinets are in good shape, this is an option for updating an outdated look. Kitchen cabinets can be stained, glazed or painted. The option to refinish the kitchen cabinets may be just as costly as replacing them due to the labor that is involved. If you are looking to update your cabinets and do not have to reconfigure the kitchen, refinishing or repainting the cabinets is a design choice for many homeowners. 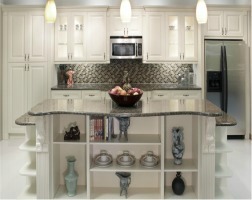 We can also add trim to the existing cabinets to create a custom look. Replace the hardware on the cabinets are you will practically have brand new cabinets! Replacing your Kitchen countertops will make a style change in your kitchen renovation that you are sure to be happy with. Before choosing your countertop, make sure you talk with the professionals at ContractorMen about the way you use your kitchen. They’d like to help guide you in your selection of your new countertops so they are as easy to use and maintain as possible for your needs. Slate: an upscale finish sensitive to lime and acid stains. Granite: durable and can be wild at times due to the marbling, be sure to clean, seal and repair as needed. Quartz: many maintenance free, stain, acid, scratch resistant colors and patterns. The non-porous surface doesn’t need to be sealed. Laminate: making a comeback due to its cost savings and multitude of colors, faux looks and designs. Wood: functional, decorative and budget friendly. Heat resistant. Need to seal. Marble: high end looks, costs equal to Granite. Can stain easily. Porous, needs to be sealed. Stainless Steel: modern, sleek look. Resists bacteria (is hygienic), easily cleaned. Glass: color options are endless, more expensive than most choices, non-porous, stain-resistant, and bacteria-resistant. Recycled: made from sustainable materials: concrete, glass, paper and plastic, comes in wide array of colors and designs, depending on the type chosen can be durable, low maintenance. Concrete: modern, sleek, customizable, energy efficient. Check out our reviews on Houzz.com from our customers! A Kitchen remodeling project is not a project that homeowners undertake very often, perhaps once or twice in their lifetimes. You want to work with a professional, who has experience, someone you can trust to carry the vision you have to the end of the project. Trust the experts from ContractorMen with over 20 years of remodeling, design and build experience for homeowners and businesses in the North Atlanta area. Call (706) 216-2244 or contact us today to schedule a time for us to come by and look at your kitchen and listen to your needs and wants for your kitchen remodeling project!